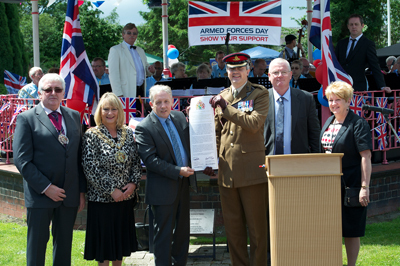 On Armed Forces Day, 30 June 2012, Tameside formally cemented its relationship with Britain’s service personnel. Councillor Gerald P Cooney, Executive Member for Learning and Achievement for Tameside and Lt Col Richard Jordan, Commanding Officer of 103rd Regiment, Royal Artillery signed the Armed Forces Covenant on behalf of the Council and residents. Tameside Council has a long and historic relationship with the Armed Forces. The signing of the Armed Forces Covenant Pledge formalises this commitment and demonstrates that the Council will take an active approach in developing services and improving access arrangements to local services. The Armed Forces Covenant is a voluntary statement of mutual support between a civilian community and its local Armed Forces Community. It is intended to complement the Armed Forces Covenant, which outlines the moral obligation between the Nation, the Government and the Armed Forces. Local organisations improving links between the armed forces and local communities can also apply for grants via the Ministry of Defence website .